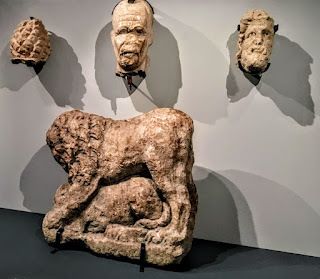 With its skeletons, skulls, tombstones and ashes of the dead, some will find the current Roman Dead exhibition at the Museum of London Docklands disturbing. For this reason it is not recommended to bring children 8 years old or under. But many children will find it as fascinating as I do. 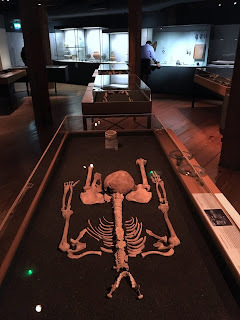 I recently attended several school workshops at the Museum of London Barbican where children aged 8-11 engaged in activities about bones and grave goods with a real skeleton in the room. They were told not to touch the real remains but to treat them with respect and they seemed to accept this as perfectly normal. If you think your child or grandchild might be interested in the fascinating customs of Roman Dead, here are my tips for making the most of your visit. Once you are in the exhibition keep an eye out for the Family Trail cards, down at kids’ eye level. They have a jolly skeleton and look like the one on the left. The exhibition is laid out so that you can go around the perimeter and not have to confront any skeletons close up (apart from some skulls). In the central area, seven full skeletons are laid out in glass cases in the middle of the dimly lit space so you can either approach or avoid them. Chances are your kids will be fascinated! 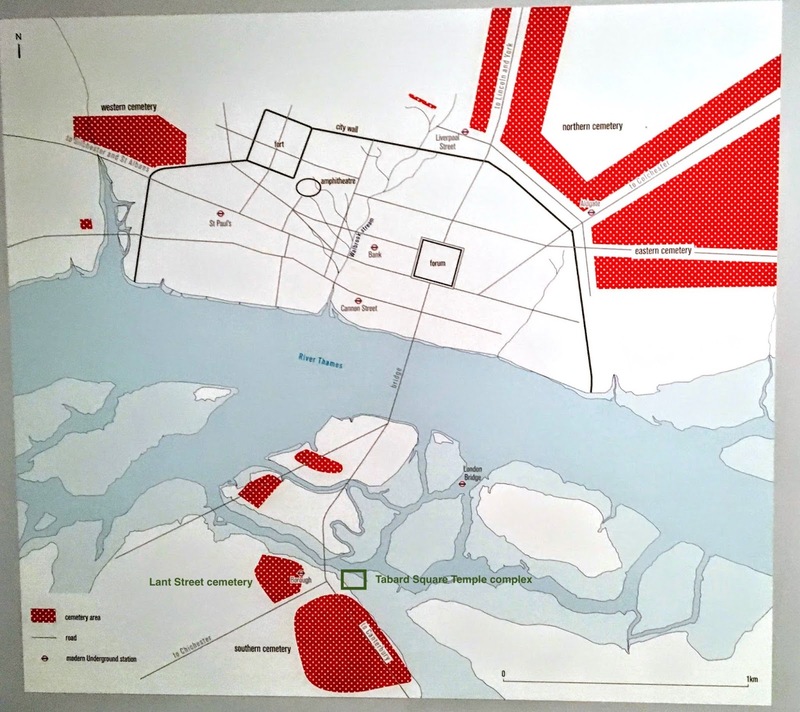 One of the first things you see upon entering the exhibition is a map of Roman London showing the locations of the several cemeteries we have found. In Roman times, cemeteries are always outside the main area of habitation. In London proper, north of the Thames, they were outside the town wall. In marshy South London where there was no town wall, burial areas were demarcated by canals or ditches. APOTROPAIC – This is a big word but a useful one. It is Greek for ‘turns away evil’. Because the Romans didn’t know about germs and viruses, they thought many illnesses were caused by evil spirits and demons. For this reason they had lots of different ways of turning away evil. Bad smells, loud noises and staring faces were all apotropaic. 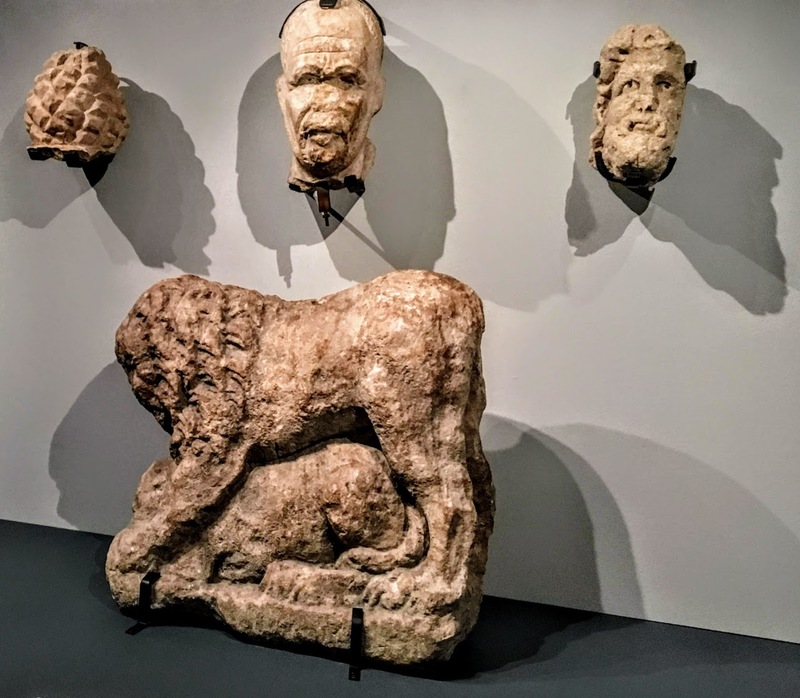 I wonder if fierce animals like stone lions and ivory leopards also protected the person who owned them against evil spirits or tomb raiders. 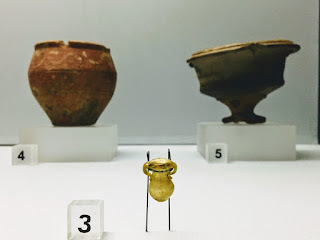 SMELL – What did an ancient funeral smell like? Take the circular lids off three different containers and see if you can tell Frankincense and Bay apart. Mastic is a gum from the Greek island of Chios. 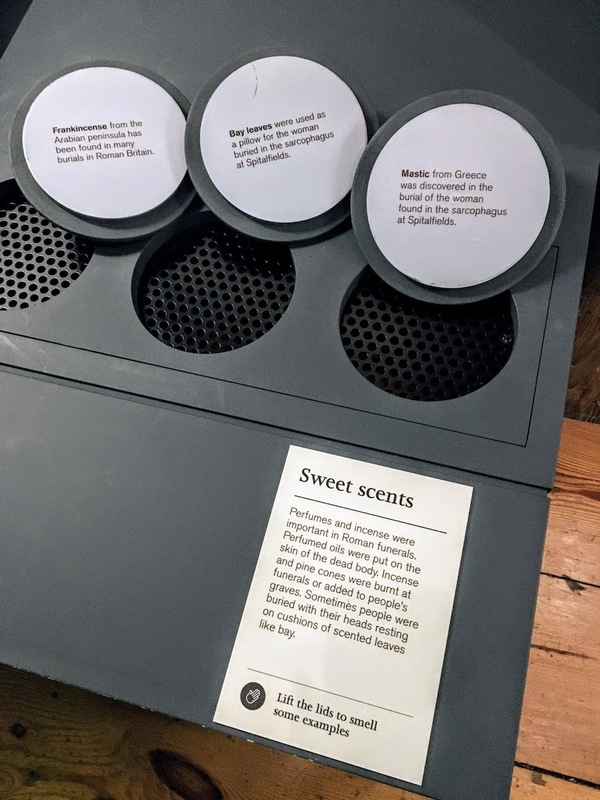 It was used to flavour drinks as well as make things smell nice. It was also a kind of ancient chewing gum, used to freshen the breath. We get the word ‘masticate’ from mastic. Bad smells were used to drive away demons but these are all nice smells, perhaps to attract protective gods. SOUND – Roman funerals were often noisy, not just with tears and wailing but often with music and rattles to keep away evil spirits. Your kids can try out an iron rattle just like some on display, found in and around the cemeteries of Roman London. 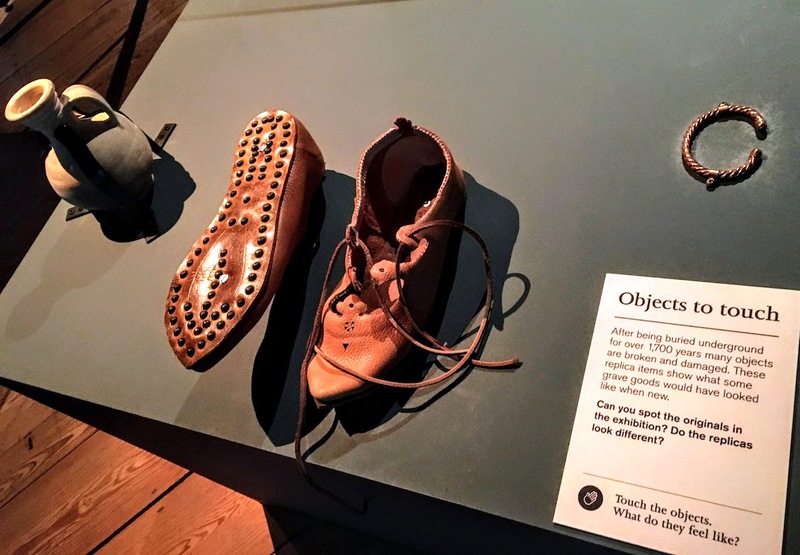 TOUCH – You can touch replicas of items in the exhibition: a hobnail shoe (bottom as well as top), a copper-alloy wrist torque and a clay jar. Each one feels different. Be sure to bring some wet wipes for after, or wash your hands! 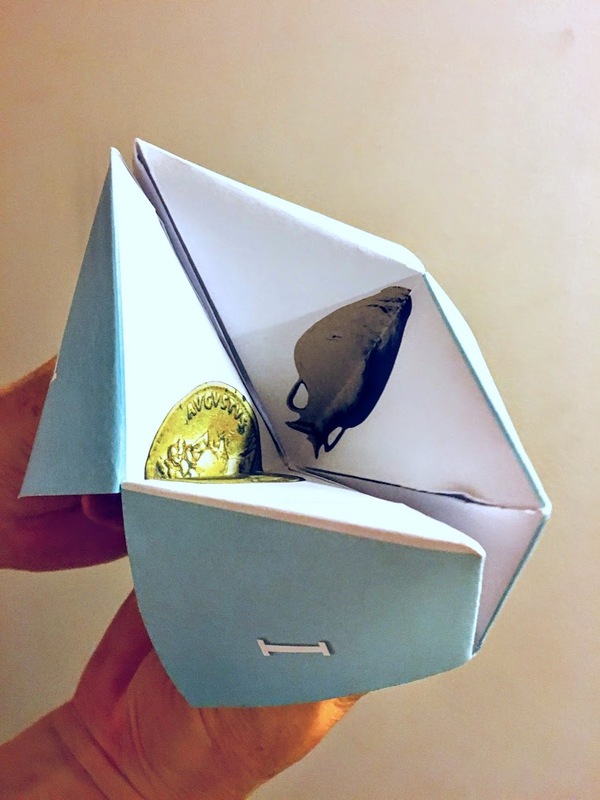 SIGHT – I love some of the tiny objects like the die made of Whitby jet and the teenie-tiny glass bottle. I also like to think that the bones of a chicken in a child’s grave were those of a beloved pet rather than a last supper. And don’t miss the jar with a face on it. That face is probably apotropaic. So is anything made of Whitby jet. Because it generates static electricity when rubbed, it was thought to repel evil spirits. BIZARRE - There are some real mysteries in the exhibit. Why does a woman have a skull over her hips? Why do some bodies have iron rings that can’t be removed? Why are parts of the bodies missing, like the heads? Perhaps Romans thought some of these things would keep the spirit of the dead person from haunting the living. Perhaps some involved black magic. But we’re not sure. It’s a mystery. I am currently writing a book about the girl who owned the ivory leopard knife. 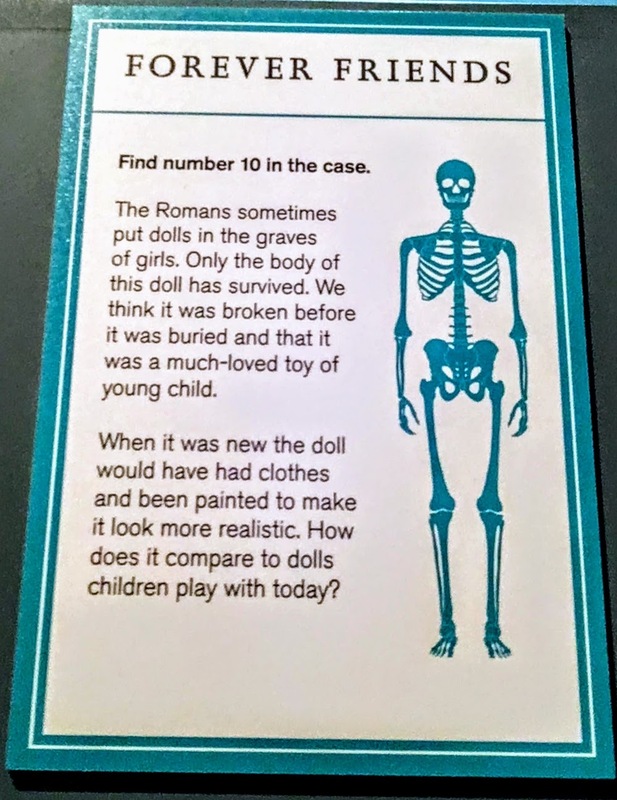 Her bones are not in the Roman Dead exhibition but back at the Museum of London Barbican site for those free workshops I told you about. INTERACTIVE – Near the end of the exhibit you will find a foam skeleton. Kids can put it together like a jigsaw puzzle. THE GIFT SHOP – Afterwards, kids can buy a replica oil lamp to try out at home (under parental supervision!). There are also other little souvenirs and lots of good books, some factual and some fiction. 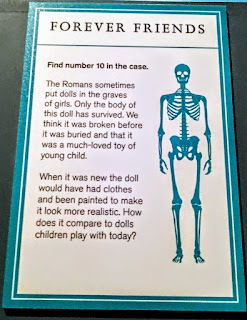 The Roman Dead is a wonderful kid-friendly exhibition. I hope you and your young relatives enjoy it as much as I did! 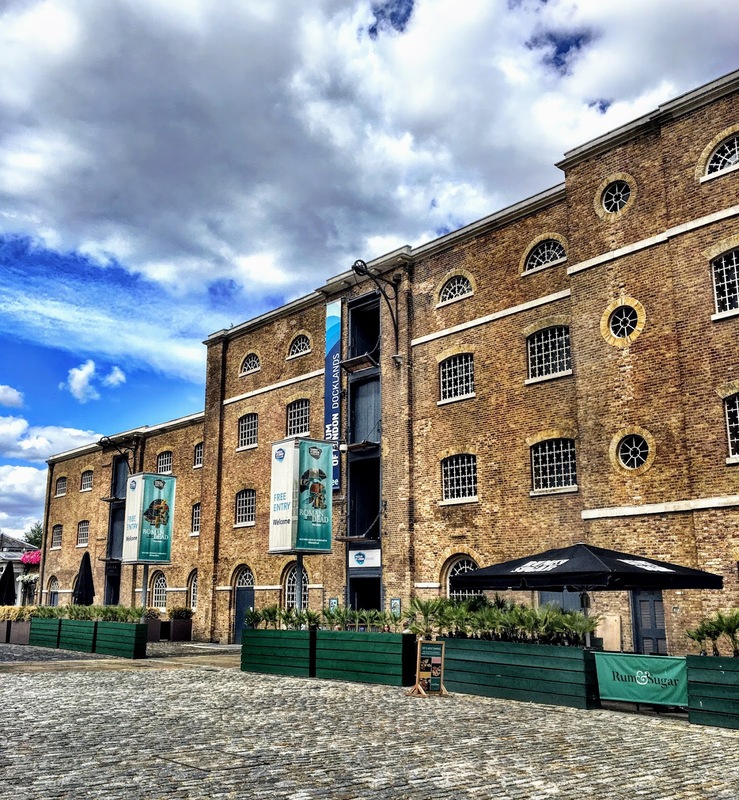 I will be giving a sneak preview of my work in progress, ‘The Girl with the Ivory Knife’, at the Museum of London Docklands on Saturday 18 August. 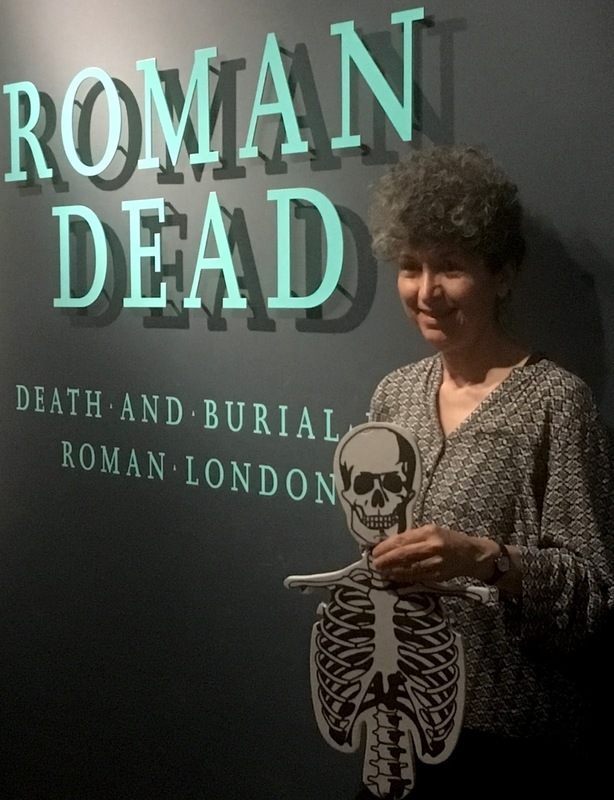 My new book is inspired by an exotic and mysterious ivory knife on display in the Roman Dead exhibition. The event is family friendly and free but you must go HERE to book your place. See you there, I hope!